The collection of fascinating articles assembled in this volume is a refreshing attempt to give renewed impetus to the study of a speech variety—Colombian Spanish—that in years past had been one of the most intensely studied in all of Latin America. Towards the end of the 20th century, that successful tradition, it seemed, had become a weighty legacy from which most Colombianistas seemed unable to free themselves. As a result, linguistic studies in Colombia became overly conventional, thereby gradually losing the opportunity to profit from more theoretically oriented trends in modern linguistics. 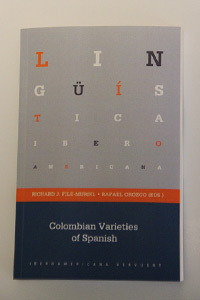 The editors have brought together studies on Colombian Spanish that employ current theoretical approaches to linguistics, while at the same time addressing topics and varieties of Colombian Spanish that remain understudied. As regards its overall conceptualization, the editors have aimed high by including articles that either extend far beyond the national borders of Colombia or transcend the narrow(er) confines of Spanish.